OFF TO SEARCH: Divers from the Coast Guard enter a pond in Ste Madeleine yesterday to search for a child. They left empty handed. THE report of a woman leaving a child at the Ste Madeleine pond on Tuesday night has baffled investigators, as searches over the last 24 hours have found nothing. Ste Madeleine police were told around 7.15pm on Tuesday that a group of people had heard a woman screaming at the water’s edge, then saw her walking away and getting into a car, before a baby was heard crying. Police rushed to the pond, which is near the police station, and councillor Shawn Premchand, who was one of the witnesses, said they got there in about a minute’s time. After an initial search yielded no result, the Fire Service was called in. Premchand was one of eight people from the Princes Town Regional Corporation who were putting up flags for the upcoming Indian Arrival Day celebrations. “The first thing we thought about was rescuing that child, but by the time we drove across the road, the crying stopped,” Premchand said on Tuesday night. Police searched in and around the pond for hours before calling off the search around 11 pm. 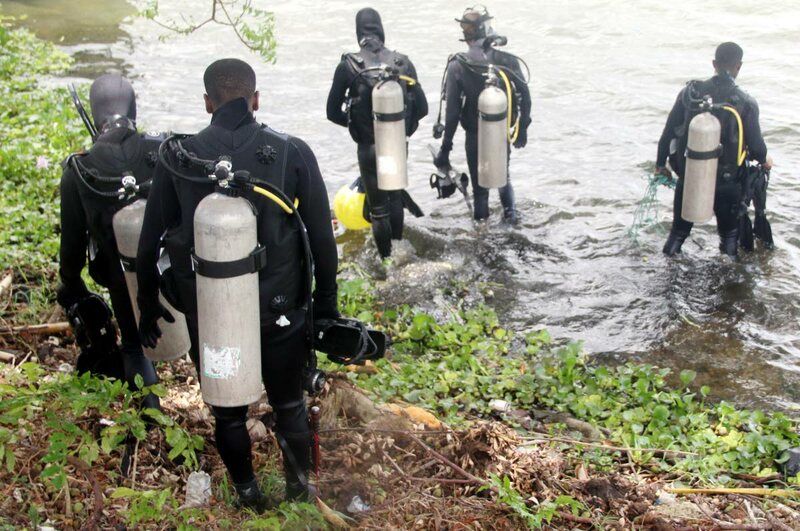 Yesterday morning, five Coast Guard divers were sent from their Chaguaramas base to do a more thorough search. Equipped with wetsuits and oxygen tanks, the divers slowly made their way through one side of the pond before calling off the search for the day. They will resume today. The activity at the scene drew looks from many curious drivers, some of whom stopped and looked on as the divers searched. One woman, who asked not to be named, drove from her Fyzabad home to ask police to tell her if they found the remains of her relative Finbar Daniel, who went missing in 2015. She said when she heard Coast Guard divers were coming to search the pond, she felt compelled to visit it, as she believes Daniel was killed and his body dumped in the pond. One resident who uses a raft to catch fish during the day said he was too scared to venture out onto the water now as he cannot bear to think he may come upon a child’s body. Coast Guard divers dispatched to search for a child in the Ste Madeleine Pond have halted their efforts for the day. According to Coast Guard’s Public Relation’s Officer, Lt Sherron Manswell, the search was officially halted around 1.15pm. The divers will return to the pond tomorrow. The divers began their search shortly before midday after members of the Princes Town Regional Corporation reported to police on Tuesday night that they had seen a woman walking away from the pond and then heard a child crying. The eyewitnesses said they rushed to place where they heard the crying but did not see anything. They said the woman left in a waiting car. They contacted Ste Madeleine police and the Mon Repos Fire Station. Both police and fire officers searched in and around the pond until around 11 pm on Tuesday. Police are also on the lookout for the gold Nissan Almera that the woman is said to have left the scene in. Reply to "Screams lead to search of pond for child"